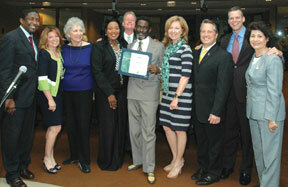 Mr. Mayor Defacto of Broward County, Larry Scott (centered with award in hand), flanked by Vice-Mayor Barbara Sharief and Mayor Kristin Jacobs with the other Broward County Commissioners as he received his certificate for 25 years of service to Broward County. Larry was decked out in his formal Mayor attire to include matching shoes. You could always find Larry helping others around the Government Center daily for over 25 years.